This is the latest in the Speaker Academy series, which started here. The series is addressed to patients and advocates who basically know how to give a speech but want to make a business out of it. I’ll try to be clear to all readers, but parts may assume you’ve read earlier entries. This post is about cash flow – an important part of being responsible for ourselves financially. In earlier posts we discussed getting agreement from your client on the value of your message and the need to get paid: Ratty Boxers, A turning point for patient voices, and Speaker Academy #15: The Contract. This post is about managing how the cash actually gets to you, because many hearts have been broken along that road. 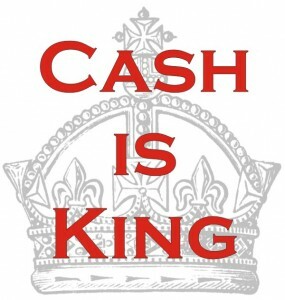 One of the most important lessons entrepreneurs have to learn, often painfully, is that cash really is king. I’m not talking about paper money — I’m talking about cash flow. Simply put, it doesn’t matter how much money is coming in the future if you don’t have enough money to get from here to there. Don’t plan to spend money you don’t have yet. 2. Manage cash flow in three stages. Contract: As we said in the earlier post, this defines the expectations on what work you’ll do, and how and when the cash will flow. It’s a red flag if a client asks you to make a commitment but they won’t (or “can’t”) get the contract signed. A contract is an exchange of promises. Receiving the down payment. As described in the contract post, many evils are discovered early, when a client who talks enthusiastically can’t produce a down payment check. I had one of those in December. Final payment and expense reimbursement. This is where the trouble can happen, though usually it doesn’t. Most people understand this: if you get a $2,000 check now, that’s better than two months from now. You can use it now to pay bills now (reducing finance charges), or if you have a pile of money in the bank, you can get two more months’ interest yourself. Same for spending $2,000: spending it now (e.g. on plane tickets) costs you more than spending it later. Big organizations understand this. Most are great to work with but a small number play this game big-time, and will routinely delay payments to everyone. I suppose it’s one thing if they’re stiffing a giant company – it hurts that company, too – but it’s nasty when they play it with the little guy. What they don’t understand sometimes is that to a big business on a fat cushion, being squeezed may be unfair but it doesn’t hurt much. To a tiny business (that would be you) it can be fatal, or at least harmful: to a tiny party, poor cash flow can trigger bounced checks and late fees, which can start the cascade into bad credit scores and other darkness. I’m going to share some true stories here of disconnects, not to scare you but just because you need to be aware of what can happen. Some of these happened before I started using contracts; some happened since. Advanstar is the sloppiest conference organizer I’ve seen. Aside from the event being a mess, they were months behind in paying my measly $1,000 honorarium, and kept saying it’d be real soon now and there was nothing they could do to speed it up. I “offered” to blog about them, and boom, in two days a check arrived. The weasels. In some organizations the finance people are weasels (there, I said it) who routinely drag their feet on paying all bills, not honoring contractual agreements. Note: finance can be weasels even if your contacts are great. Several times I’ve seen “my people” be quite embarrassed about it. You can’t hold your friend accountable – that’s why you get a contract with the whole company. But you can certainly ask them to see what they can do. Sometimes they truly can’t do anything, because some finance departments cannot be budged. I know a guy who was stiffed on his expenses by a huge famous health plan for eight months. The people I know there aren’t like that, but the money people apparently are. So when they started stiffing me, and broke several promises in a row, I thought “Eight months?? Not me!” I contacted their PR people about blogging the situation. One of them told finance, “We can’t afford the reputational risk.” Love that term. :) Boom, I got paid in 2 days. By wire. There are many versions of “The check is in the mail” and what “paid” means. Re “it’ll be paid” – note that the cash didn’t actually leave their bank account until I received and deposited it. Regardless of what they think “paid” means, the cash didn’t flow. In another case, with payment more than a month overdue, when I again “offered” to blog our emails, a senior executive in finance called and said, “The check has been released” (whatever that means … who had been holding it??). She then said “Now that you’ve been paid…” and I interrupted: “No, I haven’t – I don’t have the check yet – when will I get it?” She couldn’t say. Seriously? What kind of sucker do they take me for, thinking “I ordered a check” means “The money’s in your account”? 5. When trouble arises, stick to the facts. Don’t mind-read. That’s a famous quote from Don Berwick, creator of the Institute for Healthcare Improvement. He was talking about quality improvement – the need to be specific about how much improvement and by when. (If you’re not being specific, you’re kidding yourself.) The same applies to cash flow. Let them know again that you’re a small individual, not a big company with deep pockets. Submit bills electronically, both your expense reports and the invoice for your fee. This cuts days or more off the timeline. I send my invoices by PDF, and I use Expensify.com for my expenses. (That’s a subject for another post.) There are other apps too. Note: my standard contract says I don’t do paper receipts. A very few dinosaur clients insist on them, even though the IRS itself says you don’t need any receipt for items up to $75 – a credit card record is enough. (U.S. only) You’ll need to give each client a W-9 form, stating your taxpayer ID info. If they pay you $600 or more in a year, the W-9 lets them send the government (and you) a 1099 Miscellaneous Income form at tax time. Download a fillable PDF of form W-9 here, and save the completed version to send people. Caution: some accounting departments have waited 30 days to pay me, then “discovered” they didn’t have a W-9. Even if I point out that they do have it, some have reset their 30 day clock and started counting again! If cash is tight for you, ask them to buy the plane tickets and ask them to pay for the hotel room directly. It’s fair to tell them that waiting for reimbursement is difficult for you – you can even say “It’s important for me to manage cash flow carefully.” In my experience nobody you want to work with objects to that, although some may say they just can’t buy the tickets for you. Sometimes you have to say “I’m sorry, I can’t do the event.” When to do that is up to you. Express gratitude to those who treat you well. I’m even considering starting a “Good Partner Hall of Fame,” where I list my clients who’ve paid promptly. — Hey, here’s the first Hall of Honor entry! Just as I finished this, the phone rang, and Cheryl Hamill of the University of Mississippi Medical Center (a June client) said, “We received your books – it’s okay to invoice us.” Thanks, Cheryl! Yes, that has been suggested! I wonder if it would be useful outside of the world of patient speakers. These are great tips, Dave – thanks for putting it all down in such detail. While especially useful for those of us who have spoken or plan to speak at conferences, truly I think it’s solid business advice that applies to a myriad of situations in sales and commerce. Especially love your emphasis of the principle that a contract is an exchange of promises, and not a one-sided commitment. Sherrill, I didn’t take or have time to thank you for this back then, but – thank you! It’s so good to hear that these posts are useful! Great article. Thanks for the info, it’s easy to understand. BTW, if anyone needs to fill out an IRS W-9 form,I found a blank form here http://goo.gl/qIV9Yh. This site also has some tutorials on how to fill it out and a few related tax and legal documents.